Your purchase at the EGA Shop supports the organization that supports you during your recruit's training in boot camp and throughout his/her career in the Marine Corps. Shop for your gear where 100% of your money goes back to supporting the troops! All of our graduation shirts except the "Ready-To-Wear" T-shirts are printed and pressed in-house, which allows us to sell better-quality products, but it also means that it takes us a little longer to get them out to you. We quote 5-7 business days to produce the shirts before they are shipped out, so be sure to order your graduation T-shirts and polos early so that you receive them in time for your Marine's graduation! Our ready to wear t-shirts are perfect for the whole family! 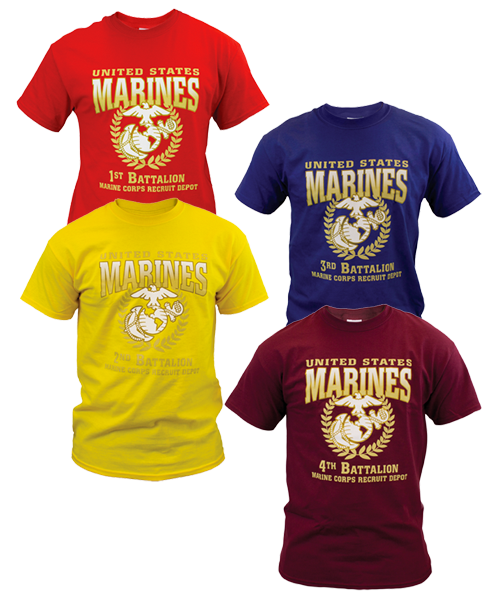 The 100% cotton t-shirt proudly shows your graduating recruit's color and battalion. They are available in unisex sizes: youth extra small through large and adult small through 3X. Looking for battalion-color shirts that can be customized on the back? We've got that! Scroll below to see our design in all-black on red, yellow or blue shirts. Want to customize your shirt? We can do that! Our exclusive design on the front of each shirt proudly proclaims the battalion number, company name, and either San Diego or Parris Island. We print the design in the battalion color, then print your choice of text on the reverse in black. Up to three lines can be added for an additional $5 per shirt. You'll love the fit of these shirts beyond laundry day--our 100% polyester won't shrink and the fabric feels softer than cotton. Available in a variety of colors in unisex, ladies and youth sizes. Mens sizes also available in a polo style. Ladies style also available as a spaghetti strap tank top. Want to customize your shirt but still sport the battalion colors? We can do that too! Our exclusive design on the front of each shirt in striking black includes the battalion number, company name, and either San Diego or Parris Island. You can customize up to three lines of black text on the back for an additional $5 per shirt. T-shirts are unisex sizes in 100% polyester. The blue is as soft as cotton. The red and yellow are printed on high-performance micro-fiber with a feel of nylon and superb wicking capability. Support your loved one by wearing their battalion crest! Customize with your family affiliation, your recruit's last name and platoon number! Our embroidered polos are timeless. Design does not include company or any text, but it's classic enough to wear on graduation day and can be worn throughout your Marine's career in the Corps. 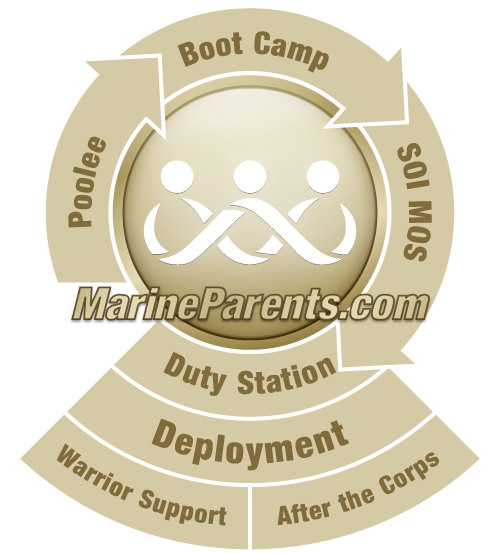 Support your recruit/Marine before, during, and after boot camp graduation with this classic recruit guidon shirt. You type in the family affiliation, your recruit's last name and platoon number, and the graduation date that you would like to appear on each shirt. When Will I Know My Recruit's Platoon Number? ¿Qué pasa después de la graduación?